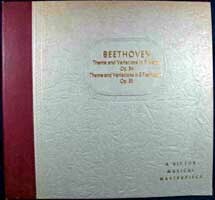 Beethoven / Sonata No.18 in E flat major. 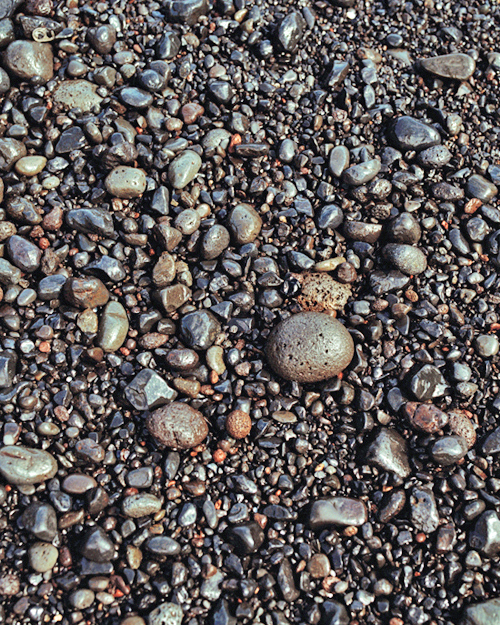 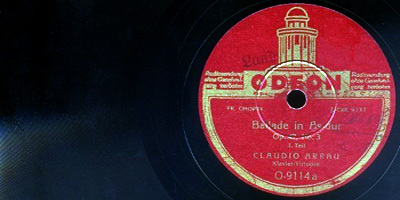 LX 1039-41 / England / 3 records / §. 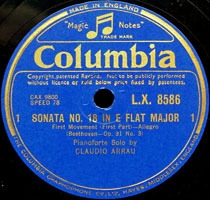 Beethoven / Sonata No.18 in E flat major. 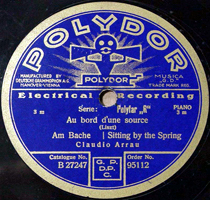 LFX 837 to 839 / France / 3 records / §. 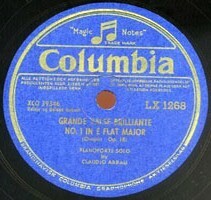 Chopin / Andante spianato & Grande polonaise brillante (Scherman). 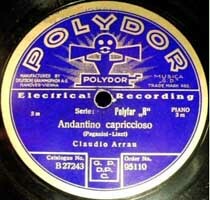 LX-1267-8 / 2 records / England / §. 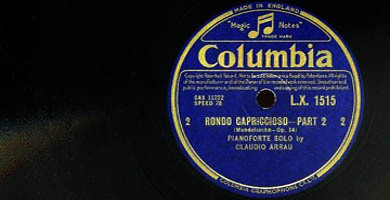 Mendelssohn / Rondo Capricioso. 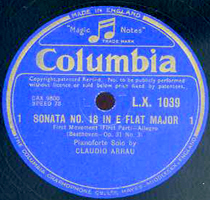 LX 1515 / England / 1 record / §. 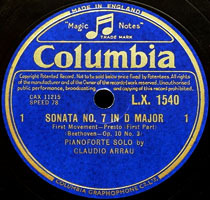 Beethoven / Piano Sonata No.7 in D major. 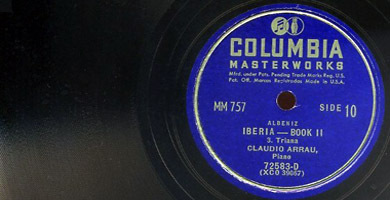 LX 1540-42 / England / 3 records / §. 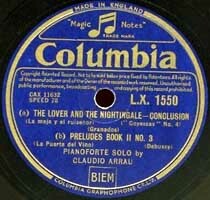 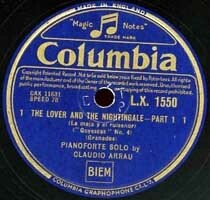 Granados / The lover and the nightingale (Goyescas No.4). 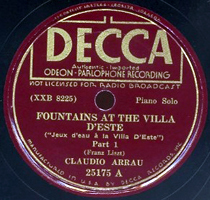 Debussy / La puerta del vino. 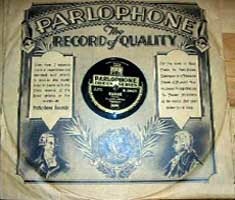 LX 1550 / England / 1 record / §. 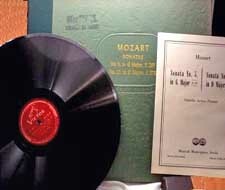 Mozart / Sonata No.17* in B flat major K.570. 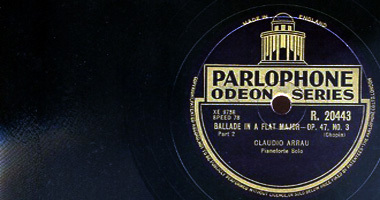 LX 1553 / England / 3 records / §. 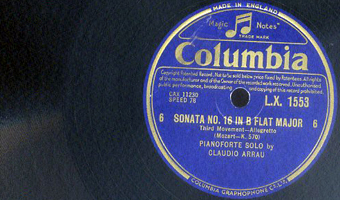 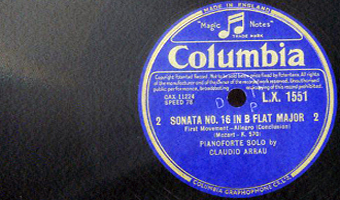 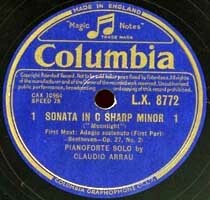 *Identified on disc as No.16. 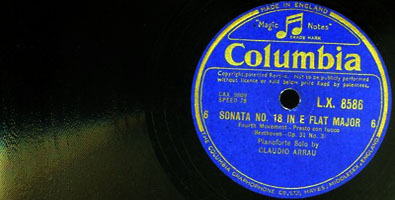 Beethoven / Sonata No.18 in E flat major. 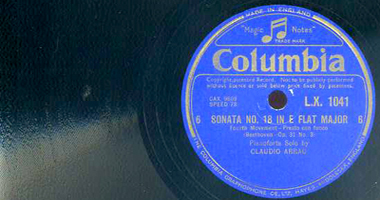 LX 8586-88 / England / 3 records / §. 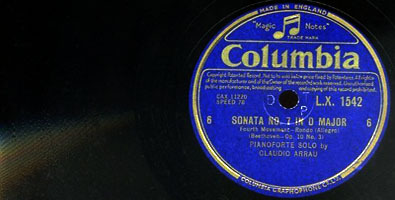 Beethoven / Sonata No.14 Op.27 No.2, Moonlight. LX 8772-73 / England / 2 records / §. 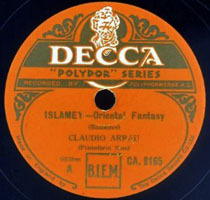 Balakirev / Islamey - Oriental Fantasy. 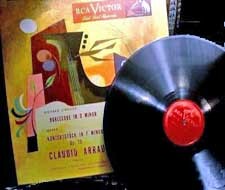 / DECCA C.A. 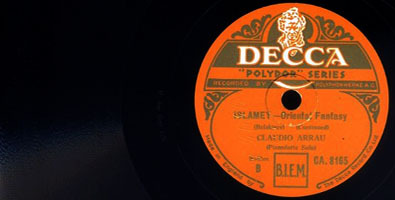 8165 A&B / England / 1 record / §. 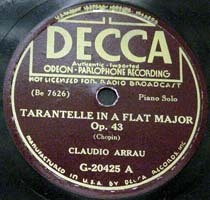 Chopin / Tarantelle Op.43. 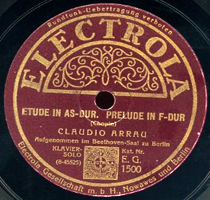 Étude in E, Op.10 No.8*. 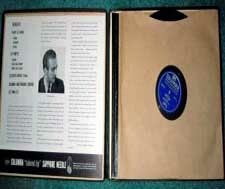 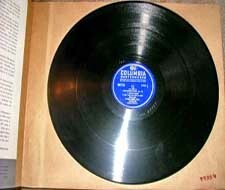 DECCA G-20425 A&B / USA / 1 record / §. 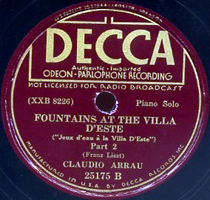 Liszt / Fountains at the Villa d'Este. 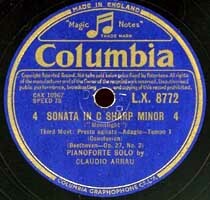 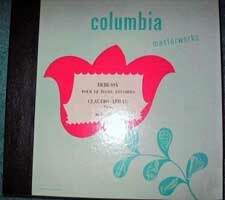 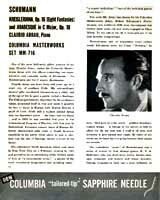 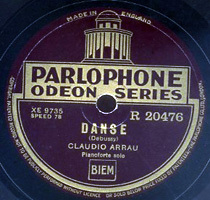 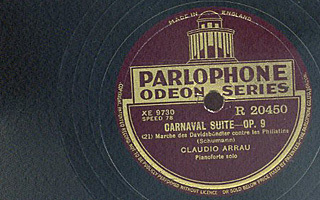 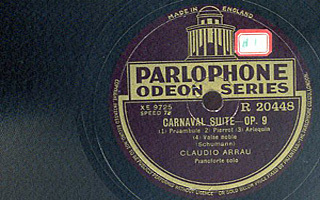 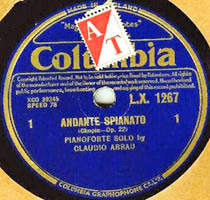 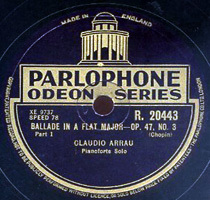 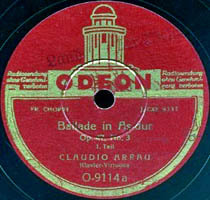 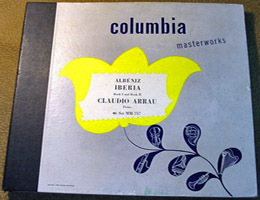 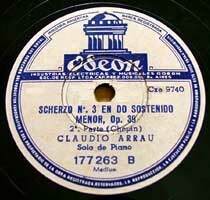 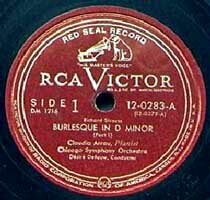 / DECCA 25175 A&B / USA / 1 record / §. 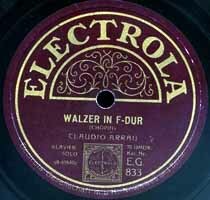 Chopin / Walzer in F-Dur. 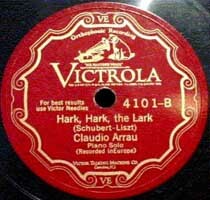 Schubert-Liszt / Ständchen (Hark hark the lark). 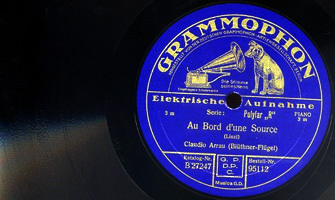 / EG 833 / Germany / 1 record / §. 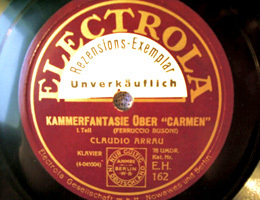 Busoni-Bizet / Kammerfantasie über 'Carmen'. 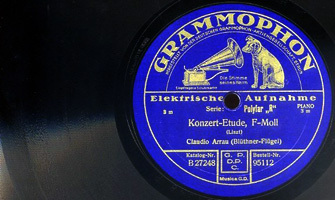 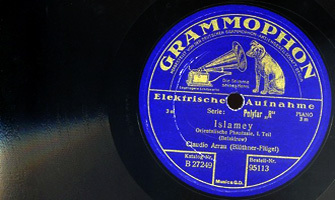 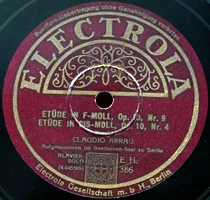 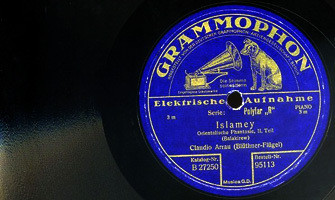 / Electrola EH 162 / Germany / 1 record / §. 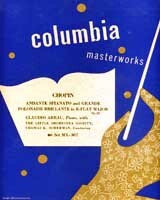 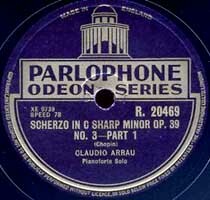 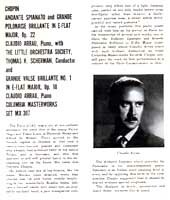 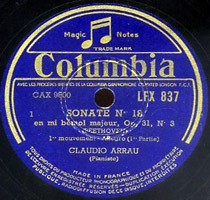 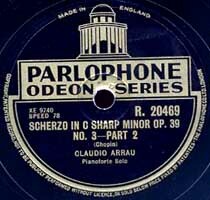 Chopin / Études Op.10 Nos.3 (1929), 9 & 4 (1928). 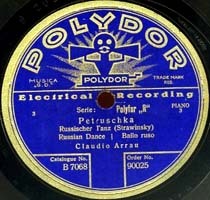 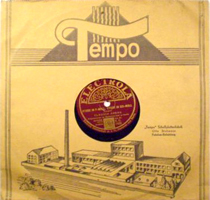 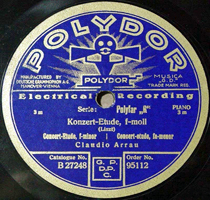 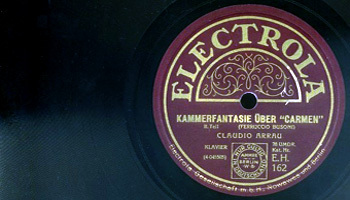 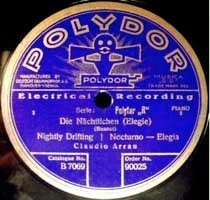 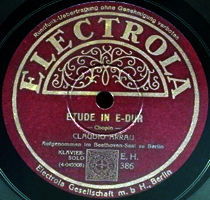 / Electrola EH 386 / Germany / 1 record / §. 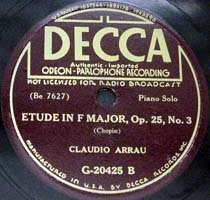 Chopin / Three Études. 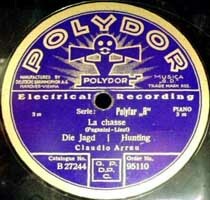 One Prélude. 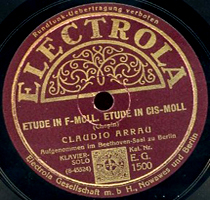 / Electrola EG1500 / Germany / 1 record / §. 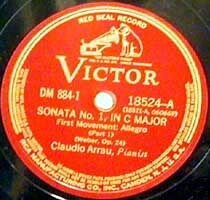 Chopin / Etude in F Major. 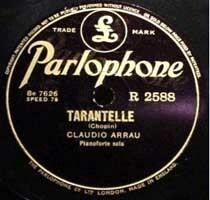 Tarantelle. 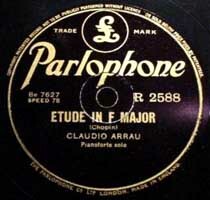 / R 2588 / England / 1 record / §. 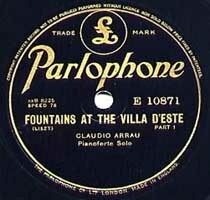 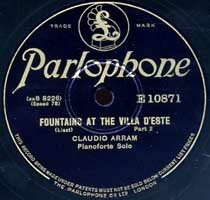 Liszt / Fountains at the Villa d'Este / E 10871 / England / 1 record / §. 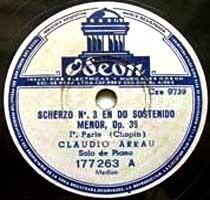 Chopin / Scherzo Op.39 No.3. 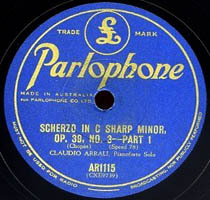 AR1115 / Australia / 1 record / §. 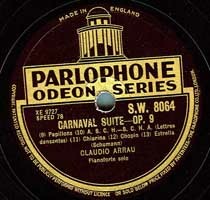 Schumann / Carnaval Suite. 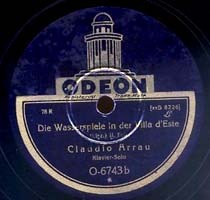 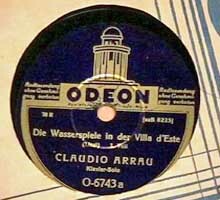 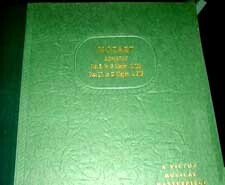 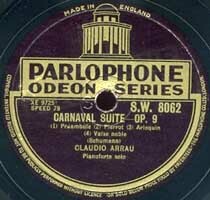 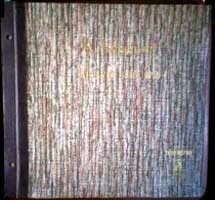 Album AP 30 SW 8062-8064 / England / 3 records / §. 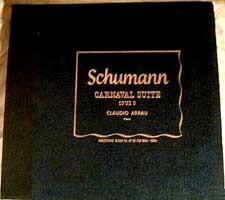 Schumann / Carnaval Suite. 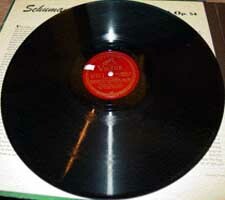 R 20448-50 / England / 3 records / §. Debussy / Jardins sous la pluie. 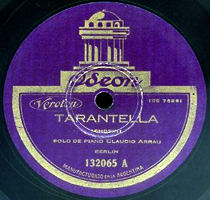 Tarantella styrienne (Danse). 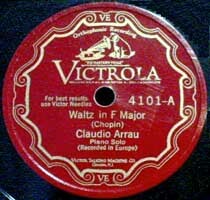 Chopin / Waltz in F Major. 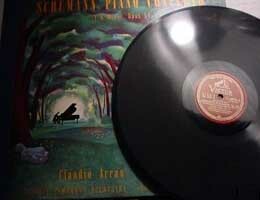 Schubert-Liszt / Hark hark the lark. 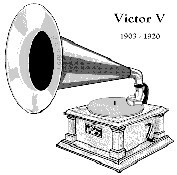 HMV Victrola 4101-A & 4101-B / USA / 1 record / §. 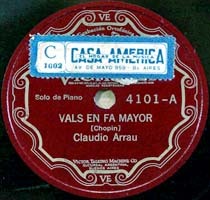 Chopin / Vals en fa mayor. 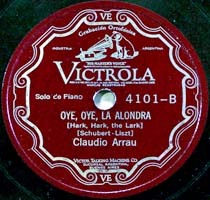 Schubert-Liszt / Oye, oye, la alondra. 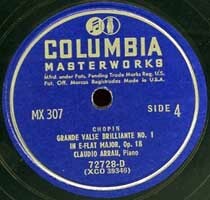 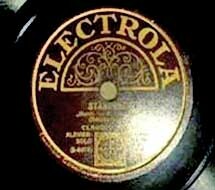 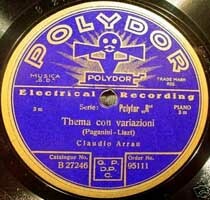 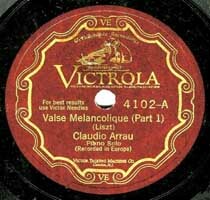 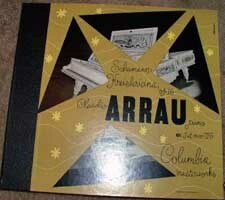 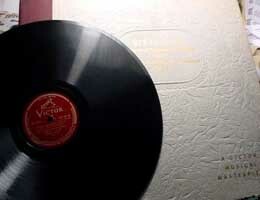 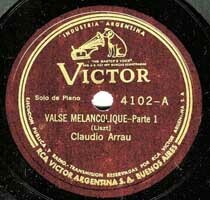 HMV Victrola 4101-A & 4101-B / Argentina / 1 record / §. 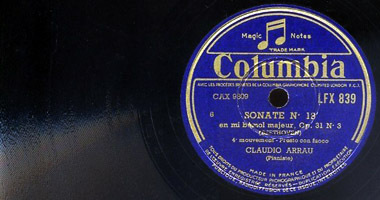 Liszt / Valse mélancolique. 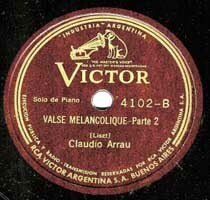 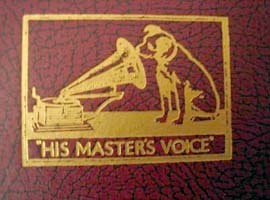 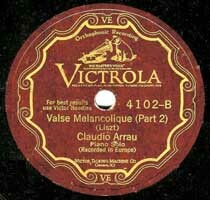 HMV Victrola 4102 / USA / 1 record / §. 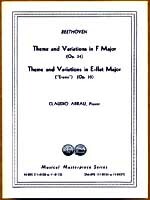 Beethoven / Theme & Variations Op.34 & Op.35. 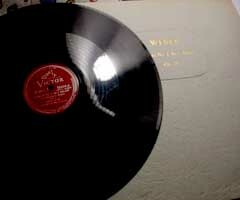 HMV Victor DM 892 / USA / 4 records / §. 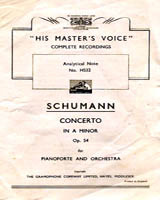 Schumann / Piano Concerto (Kreuger). 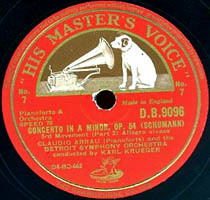 HMV Victor DM 1009 / USA / 4 records / §. 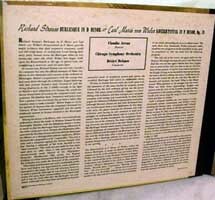 Strauss / Burleske. 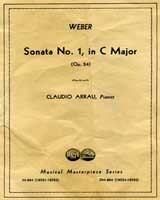 Weber / Konzertstück. 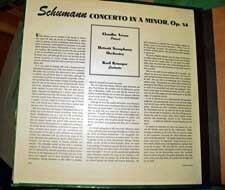 RCA Victor M 1216 / USA / 4 records / §. 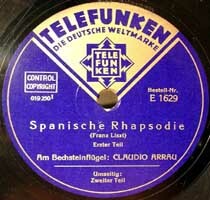 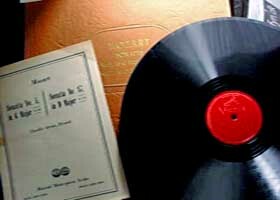 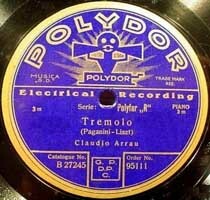 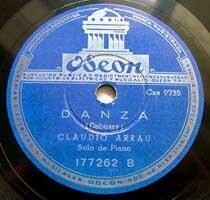 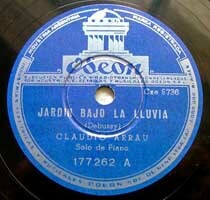 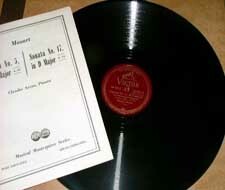 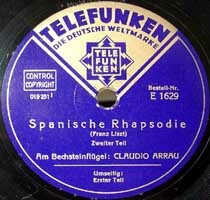 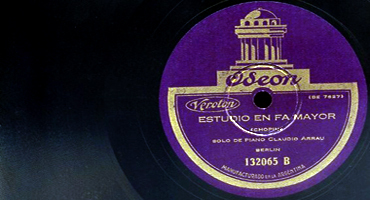 Liszt / Spanish Rhapsody / E 1629 / Germany / 1 record / §.